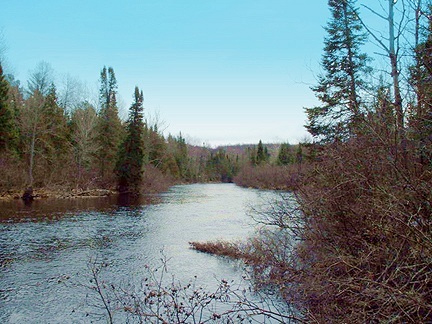 This river flows between Michigan and Wisconsin and was used by early traders and surveyors. This river section begins at the State Line Historical Site at the south end of Brule Lake, and ends at the Pentoga Road Bridge. It is approximately 13 miles from the M-73 bridge to the M-189 Bridge and an additional 12 miles from this point to the Pentoga bridge. There are some shallow rapids and good trout fishing. The Brule is popular for canoeing, spanning about 45 miles with several stop/start points somewhat evenly spread out. The Brule's flow is much more reliable that many other surrounding rivers due to its "untouched" quality. There is only one dam on the river that affects the water level, but that is located near the end of the Brule. Much of the land on both sides of the river are publicly owned with several good campsites available. Fishing is exceptional with brook and brown trout in the upper areas and tributaries. Smallmouth bass and northern pike can be found in abundance in the lower sections. Explore the Brule River as it flows gently along the Wisconsin-Michigan border. This is an excellent opportunity for beginners or families to get out and spend a half day on the water. For the quiet, careful paddler a surprise awaits around every bend; abundant wildlife includes herons, otters, beaver, deer and waterfowl. This is the perfect trip for sport recreational kayaks!